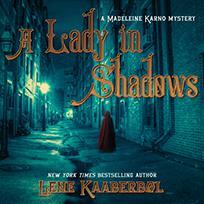 New York Times bestselling author Lene Kaaberbøl returns with her beloved protagonist Madeleine Karno—an ambitious young woman who shatters the confines of nineteenth century France as she struggles to become the first female forensic pathologist and hunt down what appears to be a Jack the Ripper copycat. Madeleine is no stranger to cases such as this. Though she is a woman in forensic pathology (a career that is considered unseemly even for a man), her recent work with a string of mysterious deaths has earned her some semblance of respect—she has even become the first female student to gain admission to the University of Varbourg. But there's only so much her physiology courses can do to help her uncover the mysteries of a mad scientist's brutal murders. Madeleine must do whatever it takes—investigate the darkest corners of the city and even work under cover—to track down a murderer at large. But if there's one thing the press has right about "Mademoiselle Death," it's this: it takes a woman to find a killer of women. Lene Kaaberbøl is the New York Times bestselling author of Doctor Death. She has won several awards, including a nomination for the Hans Christian Andersen medal. Kaaberbøl is the coauthor of the New York Times bestseller The Boy in the Suitcase, which was selected as a New York Times Book Review Notable Crime Book of 2011.